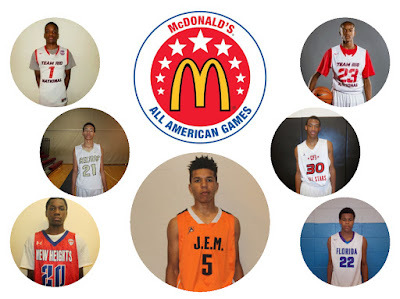 BASKETBALL SPOTLIGHT NEWS: Basketball Spotlight Alums Crash McDonalds All American Game! Bryan Antoine started on the Spotlight circuit with the CJ Hawks which eventually became Team RIO National. He finished his career as one of the best guards to come through this circuit and finished as the Player Of The Year. Scottie Lewis started on the Spotlight circuit in the 7th Grade with Team Rio Nationals. Lewis took the Spotlight by storm with his super athletic finishes. He will go down as one of the best dunkers in Spotlight history. Cole Anthony started his Spotlight career with FastBreak Basketball before joining the NY Rens and finishing his career off with Team RIO National. Cole was a dominant force since Day 1 at the Spotlight. He led the NY Rens and Team Rio National to championships during his tenure. Precious Achiuwa played in the Spotlight for New Heights and showed the versatility that many love today. He went on to become a big name on the AAU circuit and on the high school level. Precious went hard and left everything on the floor. Vernon Carey came to the Spotlight with Team Florida and had a good individual showing. The talented southpaw displayed an inside and outside game. He exploded in high school and finished as one of the top ranked players in the country. Wendell Moore played twice in the Spotlight first for the Carolina Gaters in the CB Spiders Classic and then with the CP3 All Stars at the AC Showcase. He played through middle school as one of the top ranked players in the country. His play carried over in the high school. Isaiah Mobley came to the Clash For The Cup with the I9 Celtics from California. He was regarded as one of the top prospects in this event. It’s no surprise that he became a high school star and McDonalds All American.